The Seahawks had little run production Sunday, but the wide receivers combined for just seven catches. Monday they face DE Khalil Mack, who’s even better than Denver’s Von Miller. On the Seahawks’ first scrimmage play at Denver Sunday, the Broncos got to QB Russell Wilson for the first of six sacks. The play was mostly forgotten in the subsequent litany of mistakes and misplays that cost the Seahawks a large road win. But I’m not sure that a first-play sack has happened in the Wilson era. Of all the scripted plays plotted by Brian Schottenheimer for his debut as Seahawks offensive coordinator, brandishing new launch codes for a previously moribund attack, the first play needed to be worthy. Or at least get positive yardage. Because otherwise it’s second-and-16 in the huddle, where Wilson looks around the huddle and says, “It’s not 2017, guys!” (Wilson tries not to swear). The point is relevant this week because the next game, against the Bears in Chicago on Monday night, features the 2017 NFL defensive player of the year, DE Khalil Mack. You might have seen him Monday night thrash the Packers in the first half of his debut after being traded from the Oakland Raiders. Mack might be a shade better than the Broncos’ Von Miller, who disrupted the Seahawks offense to a degree comparable to Dan Akroyd’s character Louis Winthorpe at the office Christmas party in Trading Places. The sacks, the meager 64 yards rushing and the conversion of only two of 12 third-down chance seem to have evoked a shudder even from coach Pete Carroll, who shuddered often last season. But no. And now the dieseling offense must carry on for a time without WR Doug Baldwin, their leading receiver whose right-knee MCL was sprained in the second quarter and is likely out at least for the Chicago trip. His streak of 89 consecutive starts dating to 2012 is at an end. To add depth at wide receiver, the Seahawks Tuesday brought up from the practice squad Keenan Reynolds, the former Navy quarterback who impressed during the preseason, playing the slot receiver spot at least in the fashion of Baldwin. To make roster room, they cut SS Shalom Luani, the former Washington State star. But Reynolds is not going to help where the Seahawks need help — keeping Wilson upright. 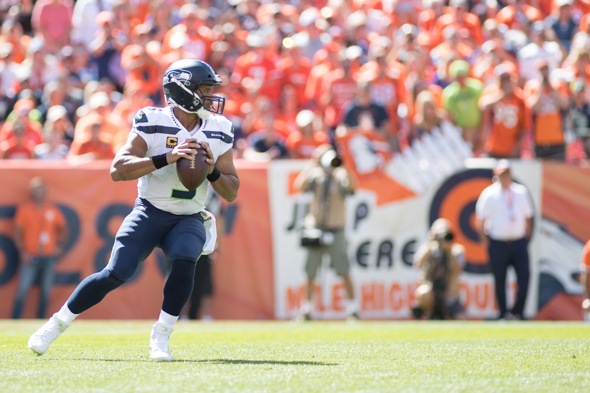 While Carroll insisted the offensive line was improved from a year ago, and held up sufficiently to allow Wilson three touchdown passes, it could not keep the Broncos’ front seven from a steady mangle of the Seattle plans. With Mack, who Monday returned an interception for a score and had a sack, a pass defensed and a fumble forced, the Seahawks face the same problems provided by Miller. Part of the solution can mean keeping more frequently a back or a tight end in protection, but that reduces potential targets. “You have to do it in a variety of ways,” Carroll said. “You can help different players on the (defensive) tackles, you can move the line in the direction (of Mack), you can get the ball out real quick. Classic things that you do against pass rushers, particularly on the outside. In the absence of Baldwin, who went catch-less in a game for the first time since 2013, Miller and friends helped limit Seahawks wideouts to just two yards in the first half. Things picked up in the second half, but for the game, backs and tight ends had 12 catches, while three receivers totaled seven for 112 yards. Whether by plan or circumstance, that’s a bashful attack for a season opener, particularly when Carroll saw the daunting advantage the Broncos enjoyed with a home opener in high heat and high altitude. The environment has helped the Broncos win 17 of their past 18 home openers, including Sunday. Carroll said conditions made some players vomit, and others required IVs. Naturally, he doesn’t want to use it as an excuse, but he did offer it up as part of the narrative. Then again, no one was winded or sick on the first play of scrimmage. That happened only after going backward. Enough with all the passing! Oy! Let’s see, hot and oxygen-free in Mile High and we’re passing the ball which, even when somewhat successful (which it really wasn’t because we can’t pass block on the right side), extends the amount of time the defense is on the field. Meanwhile, the other team runs its undrafted rookie RB like crazy, carefully taking care of its defense, which is led by an asthmatic, grass-allergic devil named Von Miller. 14 RB carries? In a season where we were supposed to get back to running? Bleck. Those 6 wins are looking harder and harder to find. IMO the Hawks should just put Baldwin on IR. If what he said during camp is true, that at best he’d be only 80% healthy this season, then just have him sit for an extended period. Don’t want a repeat of what happened to Sherman last season. When Moon took over as Husky QB, James installed a moving pocket, as the line was so-so and Moon had a gun rolling to his right. Possibly this is what we will see, as rolling to Mack’s side will lessen his effectiveness. Doubling him with a tight end will also help, as Ifedi will get trounced, 1 on 1. As to the Denver game, lets recall 2 things: If Marshall’s first TD is not called back, Hawks win. If Jaworski hits one of his 46 yard chances, we tie. So as lousy as sme parts of the game certainly were, let’s not forget this was a darned close game.